Brett Murray could not have planned it better himself. In front of the artwork dubbed Manifesto, a scripto-visual work presenting the phrase “Promises, Promises, Promises”, Liza Essers, the owner of the Goodman and Jackson Mthembu, ANC spokesman, were seated as they announced a settlement to the media, in which the ANC agreed to withdraw its case against the gallery and City Press, if the gallery agreed not to display Murray’s contentious The Spear . The notorious artwork might have given the impression that Murray’s Hail to the Thief II exhibition was concerned with the president’s member but, in fact, he is more concerned with words, or on a broader level propaganda, political rhetoric. In such a context, words become objects; like the enlarged gold gilded letters of the word “Promises”, which creates the illusion of meaning and importance, though the word doesn’t offer us any idea what this “promise” might be. The substance of the “promise” is clearly irrelevant, bringing to mind the adage “empty promises”. This artwork epitomises the once-fashionable “one-liner” tradition of art-making that critic and theorist Julian Stallabrass dubbed “high-art lite”, referring to a brand of art that aspires to superficiality, to lightness – it was very popular in Britain in the late Nineties. This is precisely the art historical context that Murray’s work should be located, though this one-dimensionality to which he aspires has different kinds of benefits vis-à-vis his subject-matter: the current political status quo. Because he wishes to highlight the artifice of political posturing, this one-liner art seems fitting for it mirrors the lack of substance, the level of honesty, which Murray clearly believes is absent. This is how Murray’s art works; he mimics, appropriates the vocabulary of the ANC as a way of drawing attention to the vacuity of their rhetoric, though at the same time he acknowledges that their words are given weight and held in high esteem – hence the words “promises” are presented as if they should be valued and applauded. It is not just empty rhetoric that Murray takes issue with in this exhibition but the pursuit of materialism, deemed a superficial objective as it’s driven by a greed for things rather than, say, values. Here again one can see how his “high-art lite” approach seems ideal; the gold- crusted words and emblems exude wealth and empty value. The problem, however, with mirroring the language of the elite he lampoons is that the work remains superficial; it presents a very one-sided view, which is overtly stated and overstated in each work. 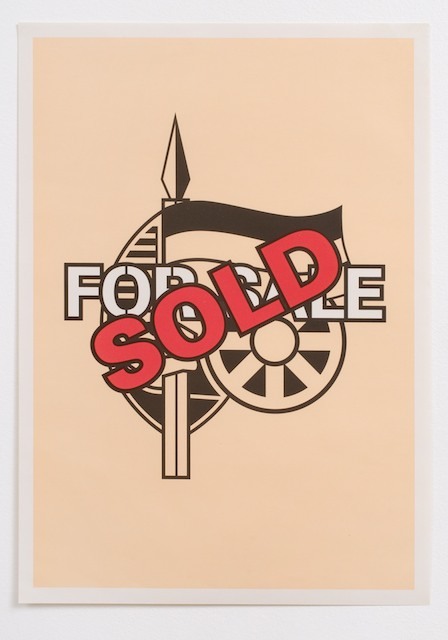 The message that is reiterated is embodied in the artwork Sold, which shows the word stamped over the ANC logo. In this drive to appropriate the language of the ruling party he also assumes and subverts communist and struggle-era rhetoric. Some have suggested that he has misappropriated this vocabulary but, in fact, all appropriation is an act of misappropriation; this is the point and difference between mimicry and mockery. Mthembu was appalled that Solomon Mahlangu’s famous gallows speech had been subverted to reflect the values of a materialist-driven authority. It is only in this subversion that Murray was able to articulate his sense of betrayal; that Mahlangu hadn’t sacrificed his life for a wealthy elite to drive BMWs and drink Chivas Regal. He also wishes to show how rhetoric from the past is used to substantiate twisted policies in the present; Julius Malema was perhaps most adept at this subtle subversion. These are hard-hitting messages; as the political posters of yesteryear were unambiguous, so too has Murray continued in that tradition. The problem is, he is no longer communicating to masses, nor do his views reflect those of the masses; so his vocabulary seems out of sync with the work, which doesn’t really come to grips with our complex sociopolitical situation. Instead he offers a glib one-liner describing it; so it’s no wonder his work has had, in the hands of certain political authorities, this polarising effect; he directs viewers towards a place where they either must agree or disagree with the sentiments he expresses. As it turns out, most disagree; despite revelations about some of the corrupt behaviour by members of the ruling party, they have remained in power. The contentious The Spear speaks directly to this fact; President Zuma is shown “letting it all hang out” yet he remains in power as embodied in the Leninist stance. It seems Murray has kind of forgotten he lives in a democracy, or perhaps has overlooked what that might actually mean when your worldview is at odds with the majority – this means living with a government that you might not support. Does he want to change viewers’ minds about the ANC – unlikely given the venue – or simply affirm what many already know?